Wrapping up its three-day meeting in Bali, Indonesia, the Secretary-General’s High-level Panel tasked with advising on the global development agenda beyond 2015, issued a communiqué that that highlights key areas that need progress for realizing its post-2015 vision. These include reshaped and revitalized global governance and partnerships; protection of the global environment; sustainable production and consumption; strengthened means of implementation; and data availability and better accountability in measuring progress. “At this week’s meeting, we agreed on the need for a renewed global partnership that enables a transformative, people-centred and planet-sensitive development agenda which is realized through the equal partnership of all stakeholders,” the panel stated in the communiqué. Before and during the meeting, the panel consulted with a wide range of stakeholders, including representatives from civil society, academia, the UN, national governments, business and other sectors, on many different development issues. Secretary-General Ban Ki-moon appointed the panel last year to recommend an ambitious yet achievable framework for the world’s post-2015 development agenda. 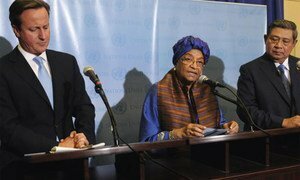 The panel’s next scheduled meeting will take place in May in New York, and the panel aims to submit its final report to the Secretary-General by the end of May. Also today, a report released by the United Nations Capital Development Fund (UNCDF) called for the post-2015 framework to address economic inequality as a priority. “Important progress towards the MDGs has been made on many fronts since 2000, despite significant setbacks due to the recent economic downturn, food and energy crises. However, progress towards the MDGs is highly uneven across and within regions and countries,” the report states. The report advocates the mainstreaming of indicators across the future goals in order to measure the degree of “inclusiveness” of growth and development, as well as use of new technologies to provide wider access to financial services. It draws on the event convened by UNCDF, in cooperation with the UN Development Fund and the Department of Economic and Social Affairs, in New York on 7 March 2013, brought together senior representatives from six UN agencies, national governments and diverse organizations, businesses and civil society groups.